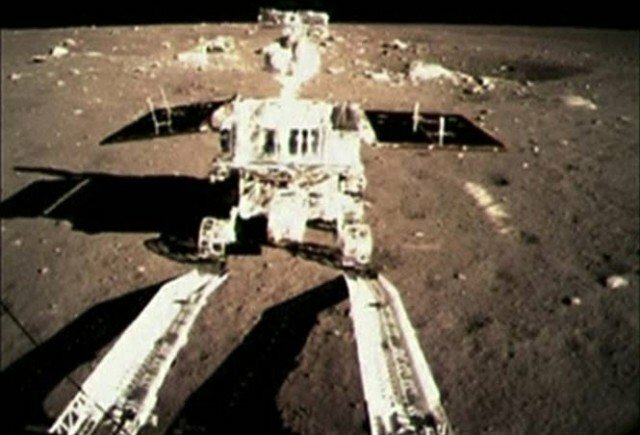 Home Tags Posts tagged with "china moon mission"
Chinese Jade Rabbit Moon rover has bid its final farewell and shut down after 31 months of exploration, far outliving its expected lifespan. Jade Rabbit arrived on the Moon in December 2013 in the Chang’e-3 space mission, and has been exploring the surface in search of natural resources. The rover made China the third country to reach the Moon after Russia and the US. The rover is named after Yutu, the pet rabbit of the Chinese Moon goddess Chang’e, in turn the namesake of the lunar mission. Designed to survive just three months, Jade Rabbit had been operating for more than two years, lasting longer than Russia’s 1970 Moon rover Lunokhod 1, which lived a total of 11 months. The Jade Rabbit’s main objective was to achieve China’s first soft-landing on the moon, as well as to explore the surface. On Weibo, Jade Rabbit has a following of over 600,000 fans. It has kept them updated with news of its discoveries, as well as cute cartoons about its antics. “There are still many questions I would like answers to, but I’m the rabbit that has seen the most stars. China’s space agency confirmed Jade Rabbit’s demise on August 3 and netizens have been mourning his loss. Jade Rabbit joins 60 American and Russian space vehicles, three Apollo buggies and two golf balls – hit by astronaut Alan Shepard – left behind on the Moon. China sent its first astronaut into space in 2003, and since then has taken huge advancements, including the deployment of an experimental space station.